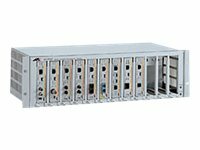 Supporting up to 12 Allied Telesis media converters, the AT-MCR12 enables network managers to use the MC1x family (10Mbps) or MC10x family (100Mbps) media converters in the same chassis. A preinstalled AT-PWR4 power supply powers the AT-MCR12, eliminating the need for multiple power connections. Allied Telesis also offers an optional hot swappable power supply to eliminate downtime on the network.The unit saves space in the wiring closet and minimizes the number of power connections required. Single-unit media converters can be removed from the AT-MCR12 and deployed individually in order to accommodate network modifications.By incorporating a backplane with 12 different power entry modules integrated with the printed circuit board, power is equally distributed among all media converters whether using one or two power supplies. Designed with a simple mounting system, each individual media converter is plugged into the back plane and secured with the included mounting rail. The rack-mount chassis includes two status LEDs on the front panel indicating power status.The top LED is titled PWR A and the bottom PWR B.The AT-PWR4 power supply in the back panel has one LED for power.When a redundant power supply is installed, a second LED is visible.